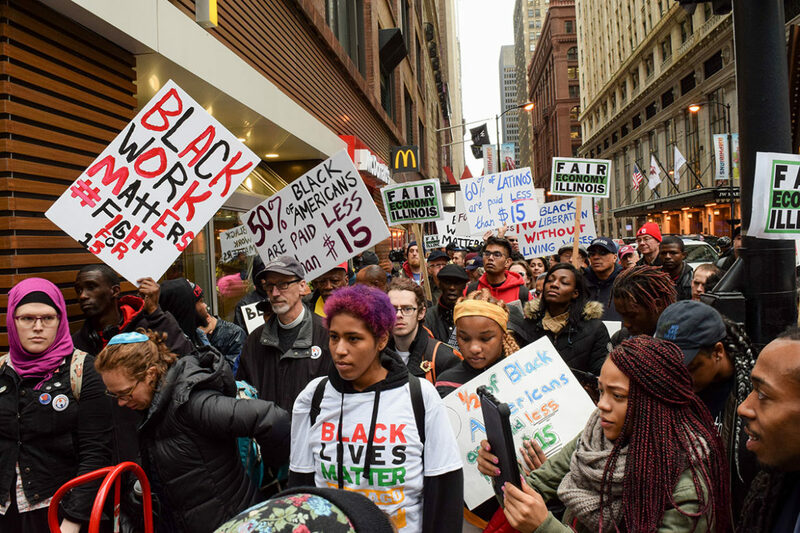 Fast food workers, Fight for $15, Black Lives Matter activists and others march outside a downtown McDonald’s demanding that the Illinois General Assembly pass a $15 minimum wage increase on April 4, 2017. Longtime activist Barbara Ransby is the director of Social Justice Initiative at the University of Illinois at Chicago, and a professor of African American Studies, Gender and Women’s Studies, and History. 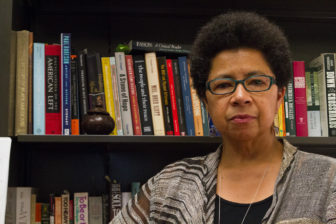 Historian and political activist Barbara Ransby is professor and director of the Social Justice Initiative at the University of Illinois at Chicago. In her newest book, Making All Black Lives Matter: Reimagining Freedom in the 21st Century, Ransby examines the emergent Black Lives Matter movement, discussing its roots and motivations, its politics and its future as part of what she calls a new Black Freedom movement. This contemporary history is especially meaningful to Ransby who works closely with the movement herself. Ransby spoke to Chicago Reporter editor David Thigpen. Your book describes Black Lives Matter (BLM) as a new kind of political movement. What do you mean by that? BLM (or more inclusively, The Movement for Black Lives) pushes back against police and state violence and the myth of post-racialism, but what is most interesting is that BLM is the first anti-racist movement to center the importance of black feminist and queer leadership. This gives the movement a larger vision for change. Traditionally there has been a marginalization of LGBTQ folks in our movements. BLM is different and stronger on this point. There’s a realization that representational politics is not enough. There is disappointment in elected officials – even some black elected officials – who fail to aggressively fight for us. What are the broader set of issues and concerns that are energizing BLM? There’s a realization that representational politics is not enough. There is disappointment in elected officials – even some black elected officials – who fail to aggressively fight for us. We’ve seen the Democratic party move toward the center, and push politics toward a corporate model, where everything is about the market. There has also been a systemic economic disenfranchisement of much of the black working class. The informal economy is being crushed. The economic landscape is part of the same ground on which the struggle against police violence is being fought. With its long record of excessive police violence, and long tradition of black political activism, it is no surprise that Chicago is a hotbed of BLM political activity. What’s happening here? Organizers need to draft and put forth a platform of demands political for candidates to commit to, and then organize to hold them accountable. There’s a generation of young progressives emerging, including Amara Enyia from here and Alexandria Ocasio Cortez in New York that represent a breath of fresh air in the electoral arena. They are not afraid to think outside the box and embrace creative solutions to the problems we all face. BLM Chicago; the Black Youth Project 100; Assata’s Daughters; Fearless Leading by the Youth; the Let Us Breathe Collective; Resist, Reimagine and Rebuild (R3) coalition and many more form important parts of the broader Movement for Black Lives, here in Chicago and elsewhere. These groups are carefully weighing in on electoral politics but have a bigger vision for change in mind. BLM is a broad coalition of groups but it is quite decentralized. In terms of the movement’s political effectiveness, is this decentralization an advantage or a disadvantage? A movement must be coordinated. I’m a big proponent of decentralized organizations, but people misinterpret decentralized power for leaderlessness. Leadership is thinking strategically and following through, bringing people together for coordinated action. It does not depend on a single person. Too often we see leadership as dependence on a charismatic leader, who is usually male. All people should feel empowered to govern and act. If a leader teaches that following is about the only way of fighting, then we have already lost the battle. This was Ella Baker’s message. In an age of social media, when a movement’s identity can be defined by its opponents or rivals, does decentralization risk muddling BLM’s message? Social media can be fetishized a bit. Different platforms have undoubtedly become powerful ways for activists and citizen journalists to mobilize. Images of Laquan Mcdonald, Walter Scott and Philando Castille ignited and sustained protest and moved many people. But we did organize before the Internet, before Twitter and even before cell phones. There are other forms of communication. Mamie Till reached and moved millions of people before the internet by using the black press. That said, social media is a tool and we have to decide how to use it and what its limits and pitfalls are. Some of the most successful social justice movements of the past have been built on multi-racial coalitions. Is that a strategy BLM favors? Yes, you can have a black organization addressing concerns of the black community and also be a part of a larger multiracial coalition that includes white progressives, Latinx (including non-Black Latinx) folks and others. We are already working in that direction. There is a new coalition called The Majority that R3 Coalition is a part of and was founded by the Movement for Black Lives. It is working on issues of immigration, indigenous land rights, labor, and LGBTQ issues. But we also have to be careful about not homogenizing our various experiences. We can be united but we are not all in the exact same situation. Even in the black community this is true. We have a great wealth divide in the black community and some of us living very different experiences than others. David Thigpen is the interim editor of The Chicago Reporter. He is a former Time Magazine journalist and is currently director of undergraduate journalism at the University of California at Berkeley. Follow him on Twitter at @dthig55.